Recreating the surroundings of upper middle class life in an antebellum row house, the 1850 House museum offers a fascinating look into times past. The museum is made up of rooms decorated in the most fashionable styles of the mid-19th century, when life in New Orleans was at its most prosperous. Visitors often combine trips to the 1850 House with stops at other famous New Orleans landmarks with a multi-attraction pass or stop off at the house on a French Quarter walking tour. The museum is not intended to recreate one family’s home; instead, it features artifacts, furniture, and ornaments that reflect tastes in design 150 years ago. The collection includes a set of china owned by Louisiana politician John Slidell and porcelain pieces from Paris, among many other antiques and paintings. The oldest purpose-built apartment building in the US, the 1850 House was built by Baroness Micaela Pontalba, whose father helped finance the Cabildo building and St. Louis Cathedral. There’s an admission charge to enter the museum. Discounted tickets are available for students, seniors, and active military; children under 6 are free. The house is arranged over different floors accessed by stairs and may not be suitable for those with limited mobility. The 1850 House is located at 523 St. Ann St., on the edge of Jackson Square in the Lower Pontalba building. It is centrally located—close to many other downtown landmarks, including St. Louis Cathedral and the French Market—and is walking distance to the Mississippi River. The 5 and 55 bus lines stop close by at Decatur and St. Peter. The house is open from Tuesday to Sunday, 10am to 4:30pm. The busiest times are in the middle of the day, so get there early to avoid the crowds. The museum is closed for some holidays—check with front desk staff if planning to visit on a major holiday. Almost every day of the year, local artists from New Orleans set up stalls in Jackson Square displaying their artwork. From colorful street scenes to detailed black-and-white drawings, there’s plenty to appreciate here—and you might just find a unique souvenir to take home. Immerse yourself New Orleans’ ghoulish side on this spooky 2‐hour ghosts and spirits walking tour. Wind through the French Quarter’s dark corridors and hear tales of famous hauntings from your local guide. You’ll visit infamous and eerie locations such as the Jackson Brewery and the Bourbon Orleans Hotel. By the end, you’ll understand why haunted New Orleans is a hotspot for paranormal investigators and historical videographers. 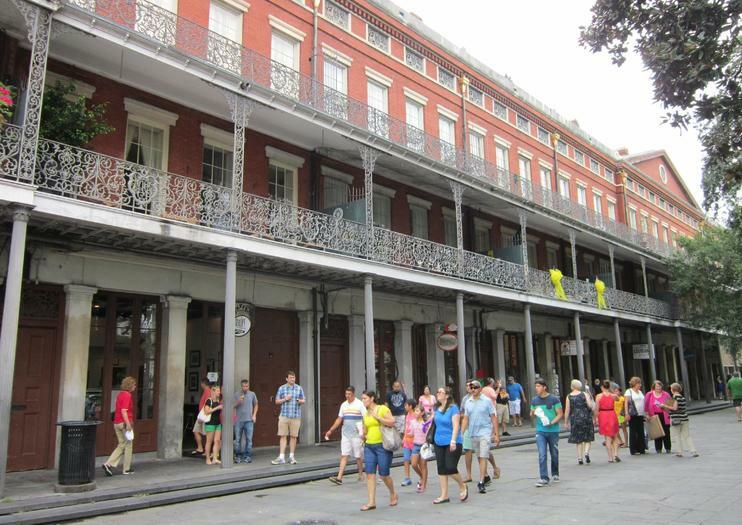 See historical highlights of New Orleans during a personalized walking and driving tour for your group of up to six people. Walk the streets of the French Quarter and Garden District, and hit sights like historic cemeteries, antebellum mansions, and beautiful parks as you explore iconic New Orleans neighborhoods. Listen to commentary from your guide and enjoy the flexibility to customize your itinerary.